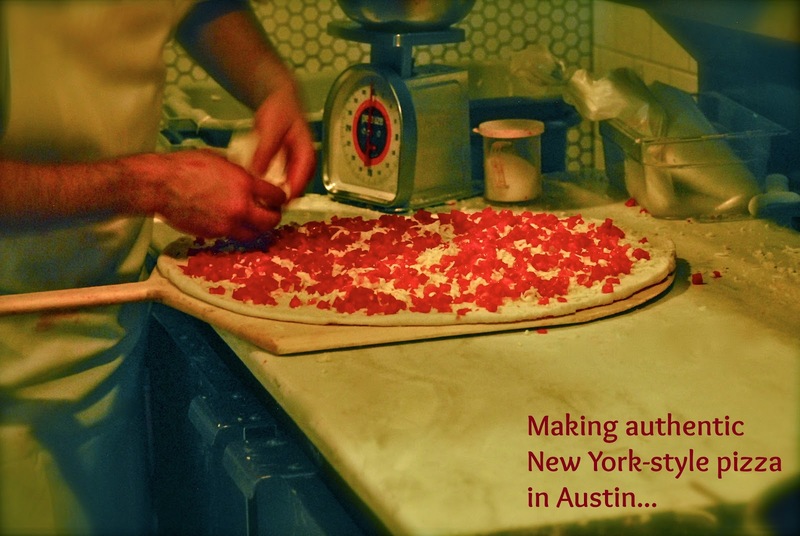 The latest installment of A Food Lover’s Weekend In… travelogue series found Michael and I making the short 1.5-hour drive from San Antonio to nearby Austin. A weekend trip that only requires a tank of gas can be a great, economical getaway -- especially when you’re visiting a fun, lively city like Austin! Austin is known as The Live Music Capital of the World, but it also features a vibrant and growing food/restaurant scene! We drove up on a Friday last month and spent a couple of days visiting some new-to-us restaurants that ranged the gamut from casual tacos and queso…to a high-tech casual Japanese-American eatery…to over-the-top, amazing doughnuts from an Airstream trailer and gourmet cuisine at a Zagat 28-rated gem…and everything else in between. We arrived in Austin and made our way to our hotel for the evening -- The Kimber Modern, which has received numerous awards for its sleek, modern architecture and decor. 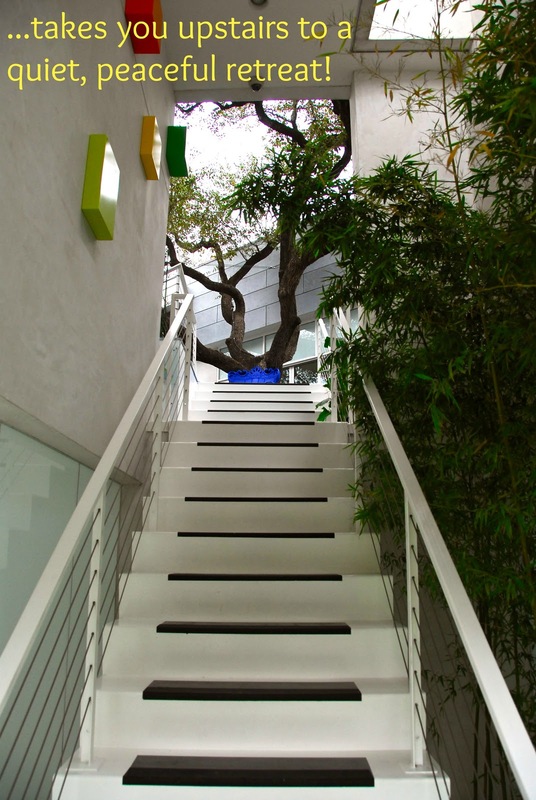 In fact, it was awarded the 2012 Texas Society of Architects Design Award. We parked our car downstairs and made our way up the stairs at the entrance. As we walked upstairs, we were immediately struck by how peaceful it was! 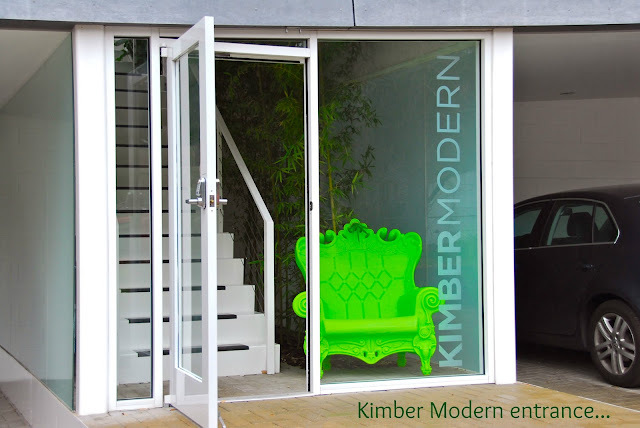 The Kimber Modern features 5 rooms and 2 suites, all of which open up to the large Courtyard area. The Courtyard features comfy couches, a peaceful water fountain, and lots of lush foliage. My first impression was that we were spending the night in an upscale tree house! The bustling South Congress (SoCo) neighborhood is directly below, but you feel miles away from the crowds after you enter the front door. Our fellow guests mingled over wine and appetizers in the outdoor common area, and everybody was welcoming and friendly. 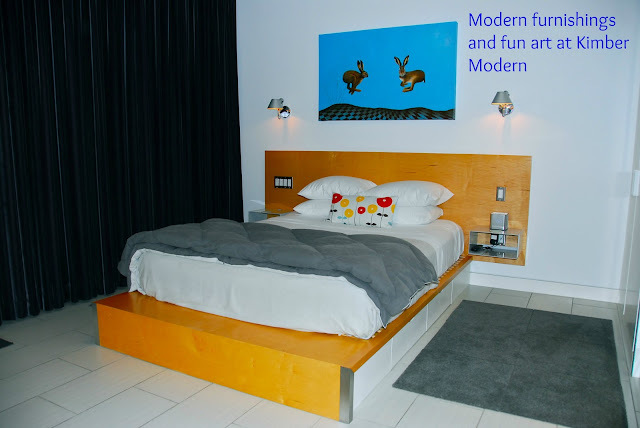 We settled in our room, The Blue Room, and were immediately impressed with the décor – modern and minimalist, yet warm and inviting. We were happy to find a plate of delicious “welcome” truffles waiting for us…a very nice touch! 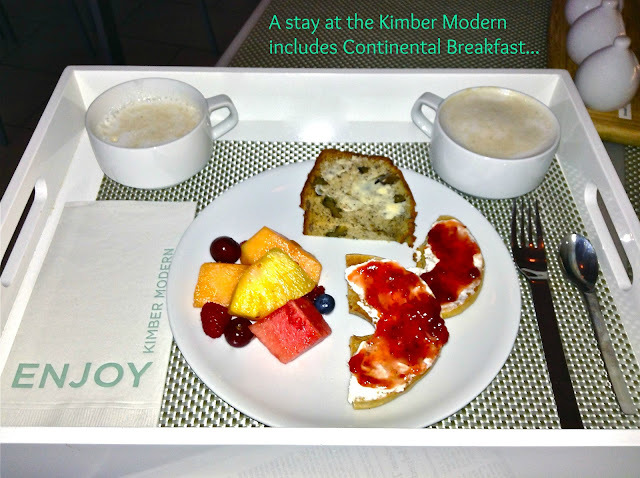 Other amenities included complimentary WiFi, and evening wine and appetizer happy hour, and a morning continental breakfast. 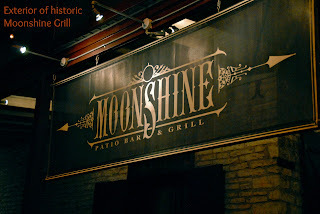 Before we knew it, is was time for dinner at Moonshine Patio Bar & Grill. 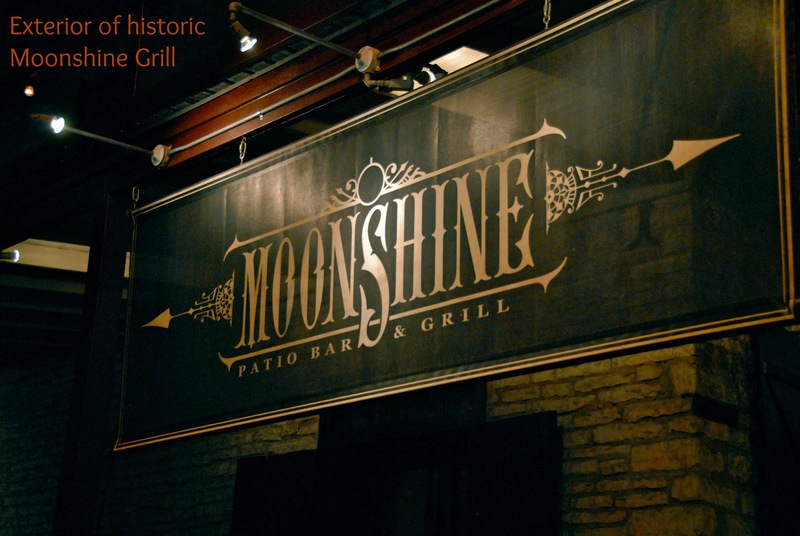 Moonshine is housed in an historic building in Downtown Austin originally built in the 1800s. We were warmly welcomed and shown to our table. We looked over the menu, and our server helped us pick a couple of cocktails and appetizers to get our meal started. Two immediately caught my eye: “Corn Dog” Shrimp and Roasted Garlic with Goat Cheese and Roasted Red Peppers. 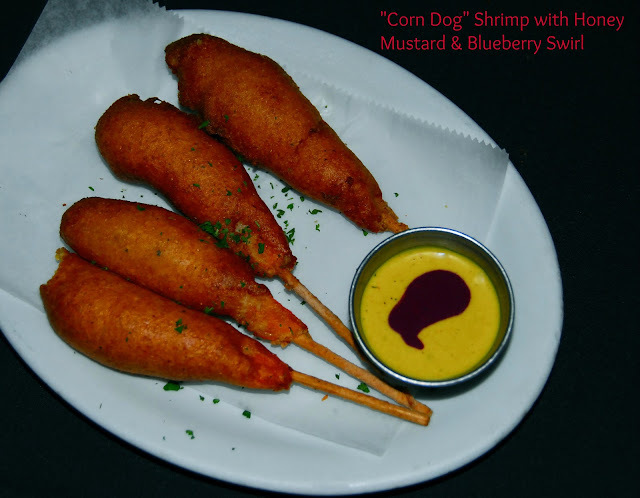 The shrimp looked just like little corn dogs on a stick…sweet cornbread batter on the outside and sweet jumbo shrimp inside. They were served with a creative dipping sauce that combined honey mustard and a swirl of blueberry sauce. Both flavors worked really nicely with the shrimp. 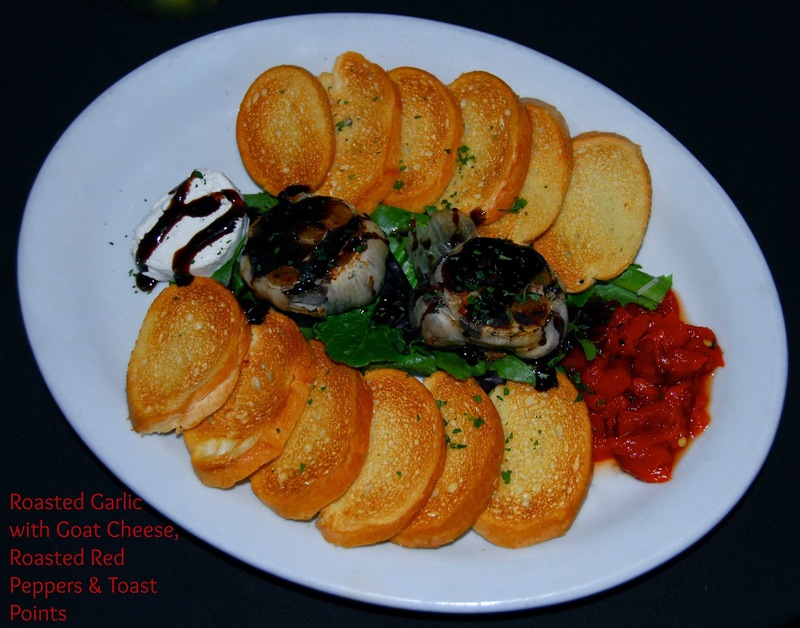 The roasted garlic appetizer is veg-friendly and totally amazing – house-roasted heads of garlic and red peppers, creamy goat cheese, and a tangy balsamic reduction…all served on crisp pieces of baguette. 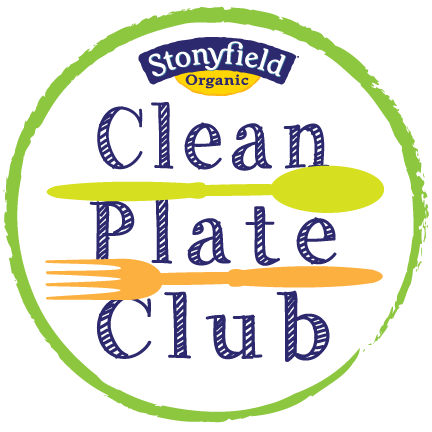 We couldn’t stop eating it…the flavors worked perfectly together! As we enjoyed our appetizers, we selected our entrees. 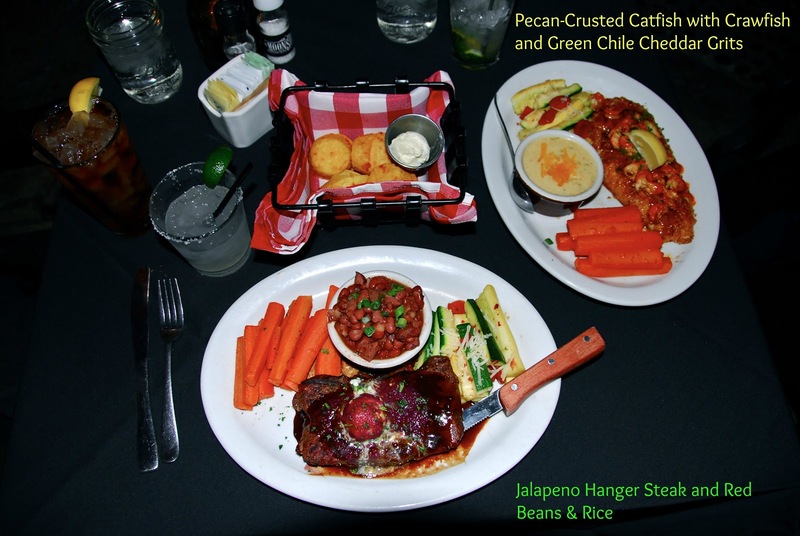 Michael opted for their spicy Jalapeno Hangar Steak, and he chose their homemade red beans & rice with jalapeno sausage for his side. Since Michael ordered steak, I decided to try one of their seafood selections. I love spicy Cajun food, so the Pecan-Crusted Catfish with Crawfish Tails and Hot Sauce jumped right out at me. I decided to pair my fish with their signature Green Chile Cheese Grits on the side. We both loved our entrees, both well prepared and full of the big flavors we love! Michael’s steak was cooked perfectly, and my fish was flavorful and moist, with just enough spice. We were pretty stuffed by then, so we decided to share a dessert. 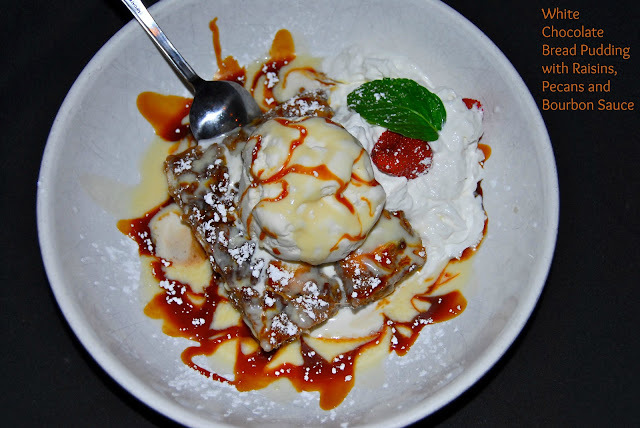 We love bread pudding, so we decided their White Chocolate Bread Pudding with Pecans, Raisins, and Whiskey Sauce was the perfect way to end our meal. The bread pudding was moist and flavorful, and the sauce was sweet without overpowering the delicate pudding. Sharing was a great idea, because the portion was very generous. We left Moonshine stuffed and happy…which is the best endorsement I can give any restaurant! 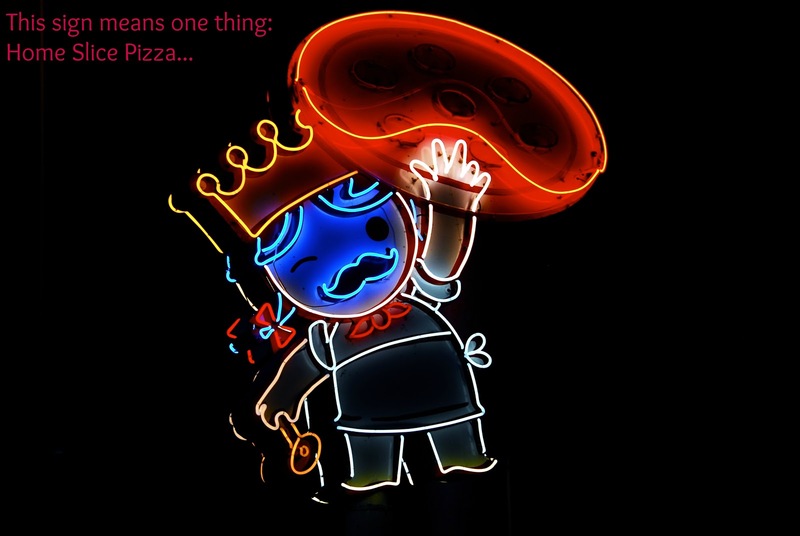 We headed back toward The Kimber Modern, making a stop at Home Slice Pizza on our way. Home Slice features authentic New York-style pizza. They have a sit-down restaurant...but they also have More Home Slice, which is located next door to the main restaurant. 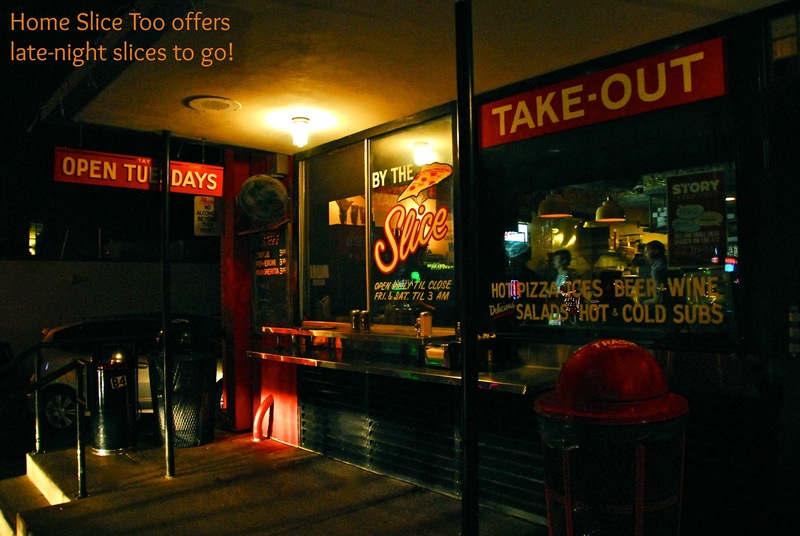 We were taking our goodies back to our room for a late-night nosh, so we stopped by the to-go location. We were greeted by the friendly staff, who showed us around. 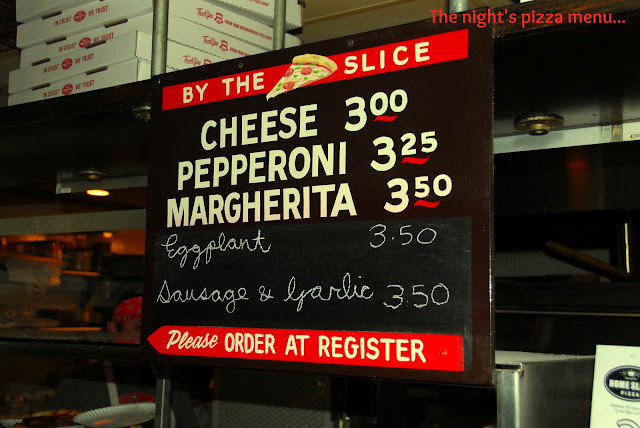 They offer four flavors each night, all baked up fresh late into the night – 300 a.m. during weekends, to be exact! It smelled heavenly inside with an intoxicating combination of baking dough, garlic, and spicy meats. Pizza heaven, I tell you! 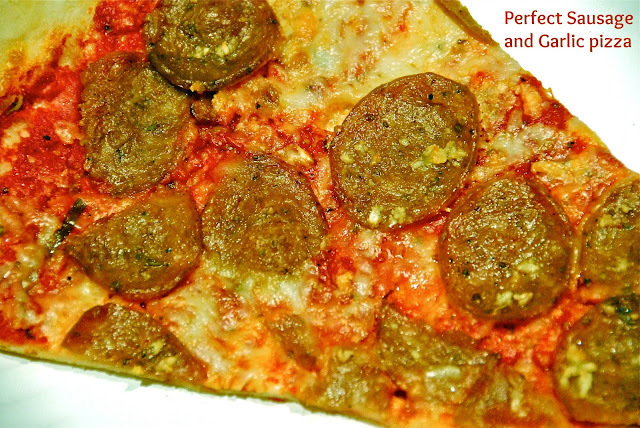 We opted for slices of margherita, pepperoni, and sausage & garlic. They packaged it up quickly, and we headed back to our Blue Room oasis. 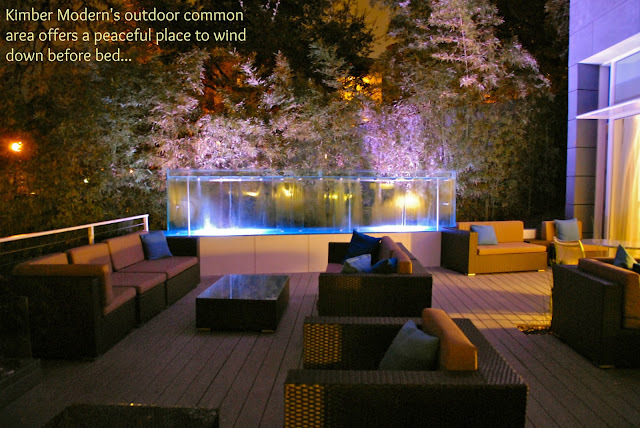 The Kimber Modern is gorgeous and relaxing after dark…the fountain is illuminated, and it’s so peaceful to sit on a cushioned sofa or relax in a hammock. 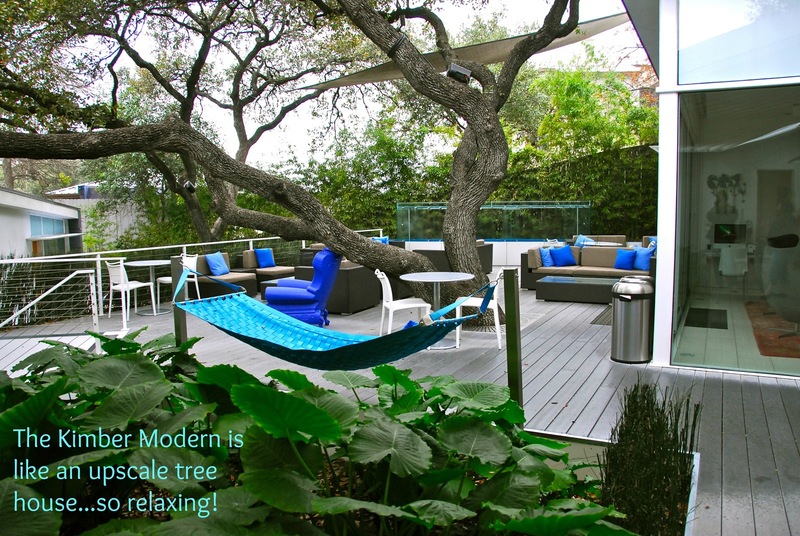 A hammock, you say? Our room had a hammock and private couch located just outside of the door, so I kicked back and relaxed while Michael snapped a few pictures. It was really relaxing. 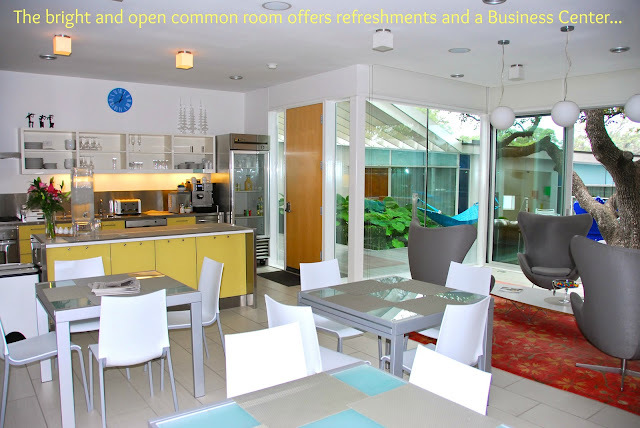 Then it started getting chilly, so we decided to head inside…but not before a quick visit to the Common Area, which is stocked with complimentary sodas and other beverage for guests to enjoy during their stay. We put on our comfy clothes and settled in for some late-night pizza. In a word, it was excellent! Thin, crispy crust with the perfect amount of flavorful tomato sauce, a good ratio of cheese, and lots of toppings. All three flavors were great, but we especially enjoyed the sausage & garlic. After our midnight snack, it was time to get some sleep…we had a full itinerary the next day! I woke up ahead of Michael on Saturday morning and made my way over to the Common Room, where a lovely continental breakfast is set up for guests to enjoy each morning. I came back from my excursion with fresh fruit, toasted bagels with cream cheese, and fresh-made lattes from their self-serve cappuccino/latte machine. We enjoyed a light breakfast in our room, relaxed for a bit to discuss the day’s plans, then cleaned up for brunch at Lucky Robot Japanese Kitchen. This innovative new restaurant is literally down the street from The Kimber Modern, directly on South Congress, so we were able to walk there and back. Lucky Robot Japanese Kitchen features fun Japanese-inspired food and cocktails. They offer a Tokyo Brunch menu on the weekends. We arrived and were quickly seated. 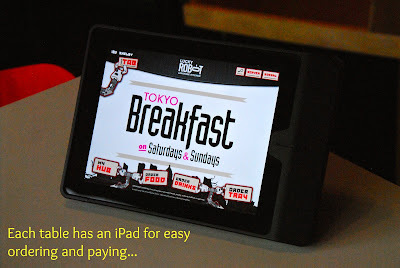 Although they have servers, each table features an iPad system that allows you to see their complete menu – with pictures, order your food, and even pay your bill. Talk about putting modern technology to good use! We started with a Pork and Shrimp Dumpling appetizer. 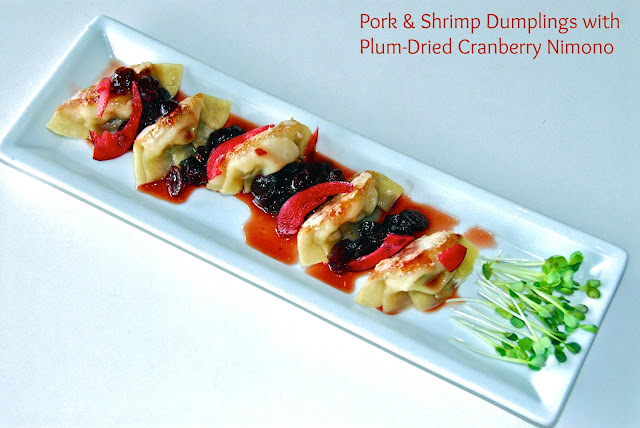 The dumplings were crispy outside and full of tender filling inside; we loved the plums that were served alongside. 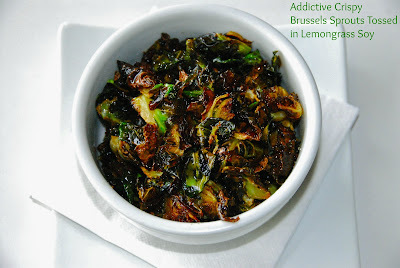 Our server recommended their signature Roasted Brussels Sprouts with Lemongrass Soy. Confession time: I am not normally a huge fan of Brussels sprouts, but doing these restaurant features has taught me one thing: when something comes recommended by the chef or our server? It’s usually a good idea to try it! She didn’t steer me wrong; these sprouts were addictively good: crispy in some spots and tender in others…and tossed in a savory-sweet-sour sauce. I couldn’t stop eating them! Next up were our entrees. In college, I had a roommate from Japan. Pieko would often make a pancake-like comfort food called okonomiyaki, and I loved it. I hadn’t had it in years, so I was thrilled to see Nomnomiyaki on the menu. 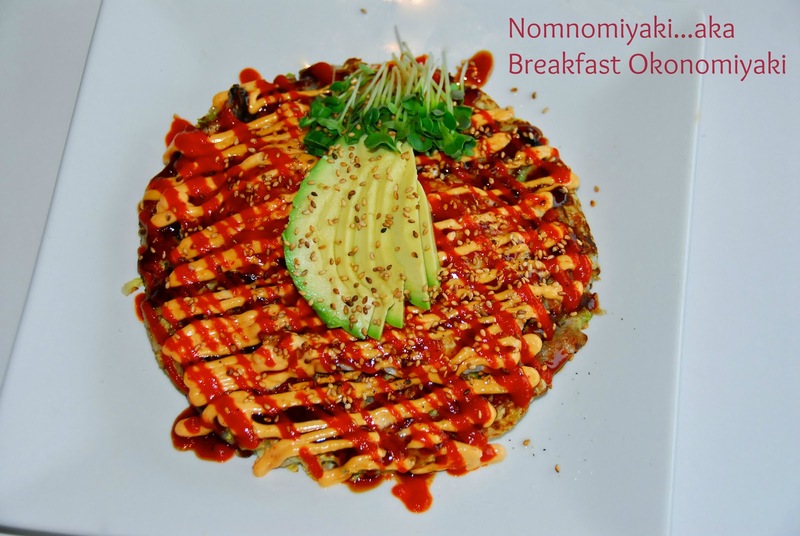 It was made with brown sugar-crusted pork belly, fried eggs, napa cabbage, ginger scallions, tonkatsu sauce, spicy QP, avocado, and sriracha fried shallots. Michael opted for the Robo Scramble with Ginger-Scallion Home Fries. 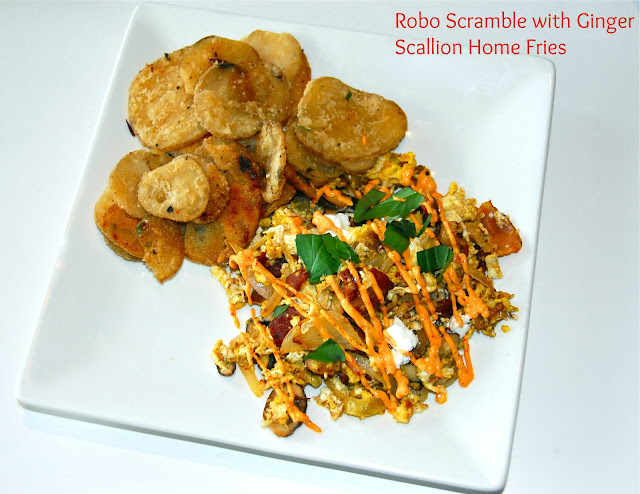 The scramble was full of flavor and contained hickory smoked bacon, caramelized onions, shiitake & crimini mushrooms, thai basil, goat cheese, and spicy mayo. We both enjoyed our food…the portions were filling, and the flavors were robust and savory. 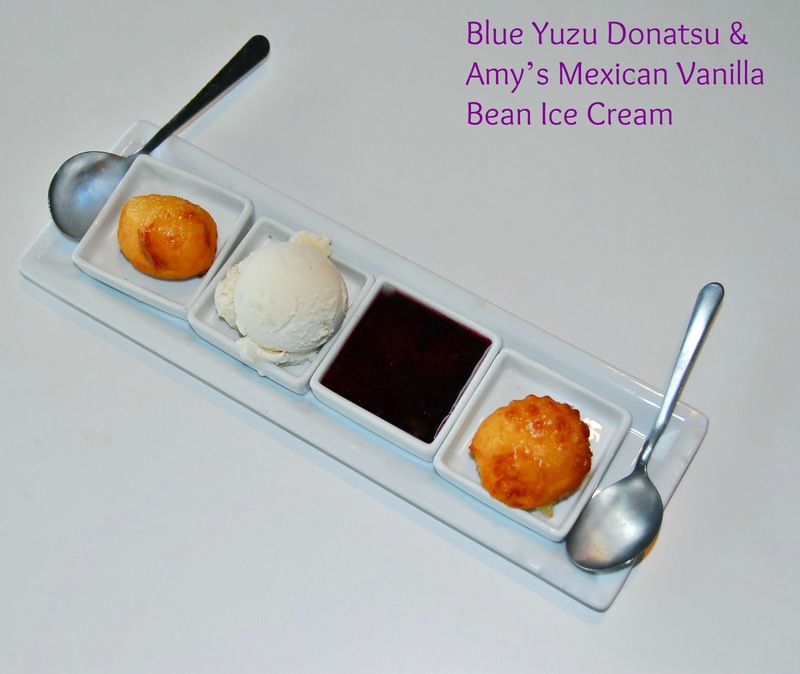 We were getting pretty full, but our server highly recommended that we try their Blue Yuzu Donatsu, served with Austin's own Amy’s Mexican Vanilla Bean Ice Cream. Since I'm always up for a little sweet ending to a meal, we ordered one to share. It was simple, but amazing! The little fried doughnuts were crispy outside...and light as air inside. The fruity dipping sauce was tangy-sweet, and the ice cream bridged all the the flavors and textures perfectly. The portion size was perfect too – just a bite to put a sweet end to the meal. From there, we walked back to the Kimber Modern to grab our bags and head out. 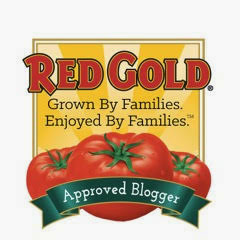 When we arrived, we met owner Kimber Cavendish and thanked her for a lovely stay. Before we knew it, it was time to leave our relaxing tree house hideaway in search of more culinary adventures! 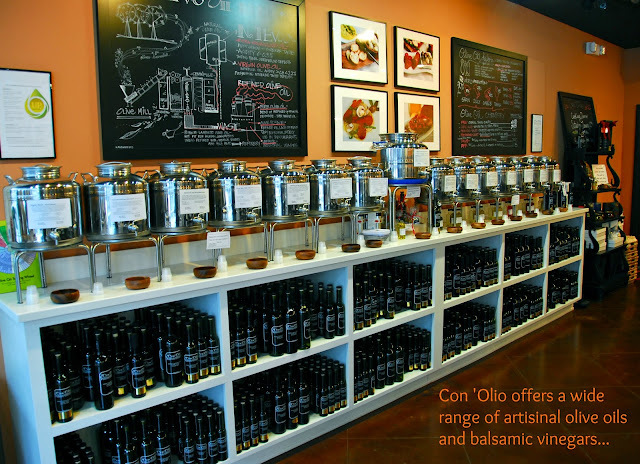 Our next stop was to visit owner Jeff Conarko at Con ‘Olio, my favorite artisanal olive oil and balsamic shop. They have two locations in Austin, and we stopped in for a tour and tasting at their Downtown location on Lavaca Street. 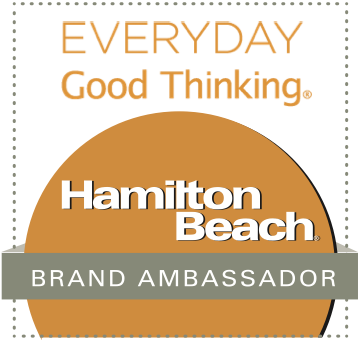 I’m going to tell you all about our informative visit and tasting next week, when I do a spotlight feature on their amazing oils and vinegars. For now, I’ll leave you with a picture of the olive oil portion of their store…and a link so you can check out their amazing product line, including their online store! 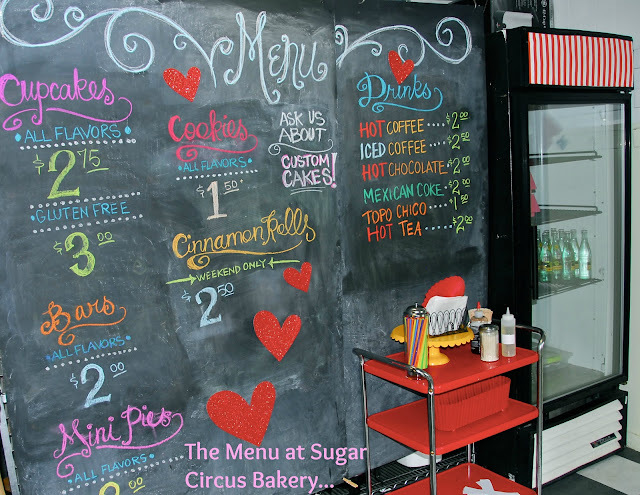 After our tasting, we headed to Sugar Circus Bakery, a fabulous bakery that features both traditional and vegan desserts. 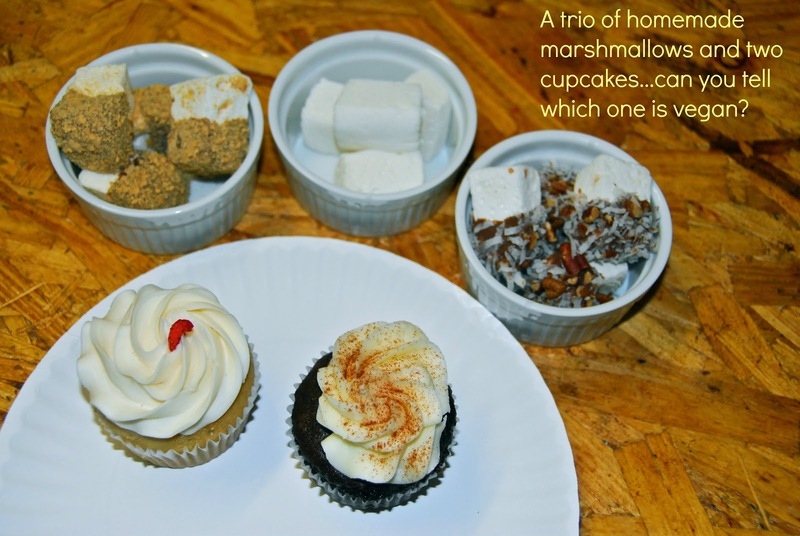 Their homemade goodies include: cupcakes, cakes, cookies, mini pies, cinnamon rolls, and gourmet marshmallows. We stopped by to sample some of their items and learn more about their bakery. 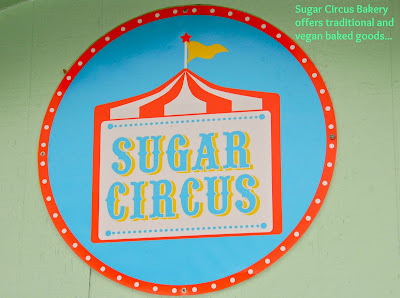 Sugar Circus was formed by merging two of Austin's premier dessert companies: Sugar Tooth Bakery and SugarPOP Sweet Shop. Meghan Krasnoff started Sugar Tooth Bakery, an all vegan dessert company, in 2008. SugarPOP Sweet Shop was founded by Belinda Espinoza in 2002. She combines baking and design elements into their delicious and beautiful creations. 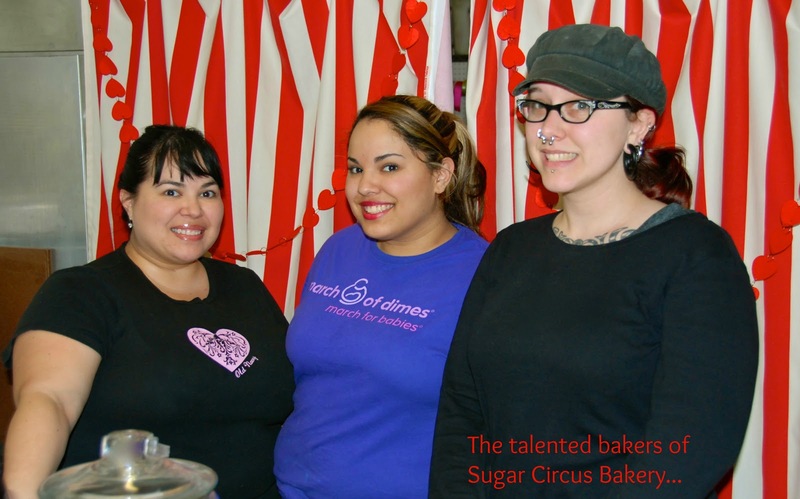 By joining forces, they're able to provide traditional and vegan baked goods in one location! 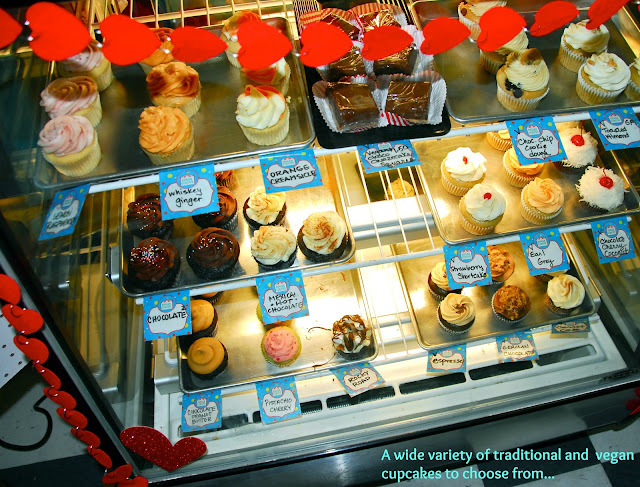 I was especially interested in tasting the vegan baked goods since I’d never tried any before. Meghan brought out two cupcakes for us to sample – one traditional, one vegan – but didn’t tell us which was which. In a blind taste test? We couldn’t tell a difference in flavor. The texture of the vegan cupcake was a bit more dense than the traditional cupcake, but it was moist and tasted great. We also sampled some of their light-as-air marshmallows…the German Chocolate was especially good. We said our goodbyes, but not before they generously packed up more cupcakes – both vean and traditional – for us to enjoy later that evening. All of the flavors were fabulous, but our favorites were the Lemon Raspberry and the Orange Creamsicle. 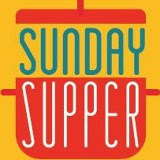 We still had more culinary adventures on the itinerary for Saturday afternoon and evening…and Sunday. To hear more about those adventures, you’ll have to read the second half of A Food Lover’s Weekend in Austin. Come back on Thursday evening to hear all about our experiences at Alamo Drafthouse Cinema, Congress Restaurant, Torchy's Tacos, and Gourdough's Doughnuts! 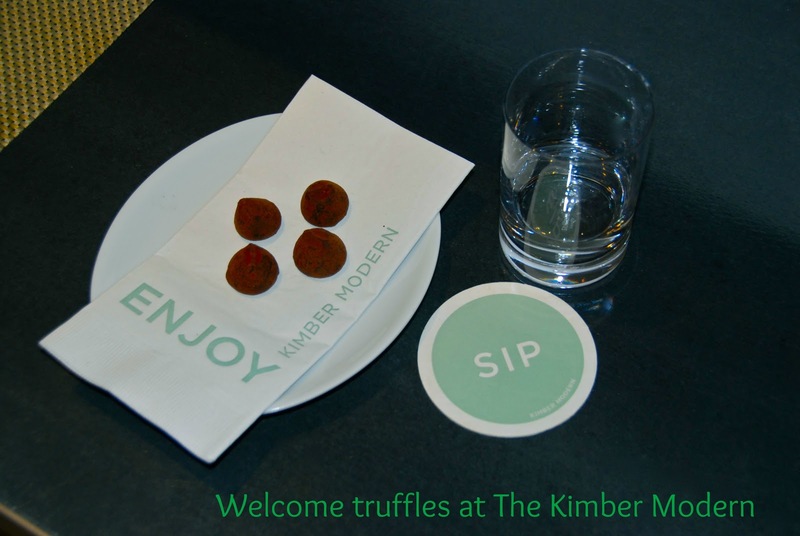 Disclosure: The Kimber Modern and the restaurants, shops, and bakeries spotlighted in this article hosted us in order to facilitate inclusion in this article. All opinions expressed are my own, and all photographs are copyrighted by Michael K. Garcia. They may not be copied without his permission.